In the past decade Google's email application Gmail has grown in popularity. With around half a billion active Gmail email accounts, it has become the free email provider of choice for most people. However, with such a popular email application like Gmail, one of the inherent problems is that of mistaken identity. That is, it is very easy to send an email to the wrong person and that can often have interesting results. Such was the case recently with an invitation for a retreat for Jewish leaders. In 2005 Gary Rosenblatt, the editor and publisher of The Jewish Week, created an annual conference called The Conversation. Each year Gary invites some 50 participants (a cross-section of artists, rabbis, entrepreneurs, educators, philanthropists, activists and communal leaders) who converge on the Pearlstone Conference and Retreat Center outside of Baltimore, to discuss the issues of day in an Open Space forum. 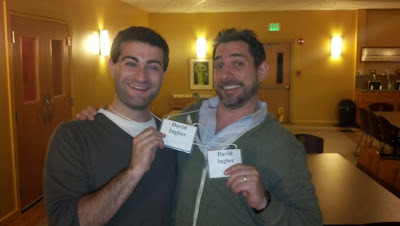 On the first day of the retreat yesterday I, like several other participants, noticed what seemed like an odd coincidence that there were two participants named "David Ingber" in attendance. I took note of this because "David Ingber" isn't such a common name in the American Jewish community and it therefore seemed unusual for there to be two participants out of only fifty with that same name. It wasn't until dinner yesterday evening that I learned the reason for the participation of the two men named David Ingber here at The Conversation. It turns out that in an attempt to invite Rabbi David Ingber, the charismatic founder and leader of Romemu, a growing Manhattan synagogue, a different David Ingber from New York received the invitation which was sent to a Gmail account. That Gmail email account, like millions of others was simply a first and last name followed by the domain gmail.com. So the invitation to participate in The Conversation arrived in David Ingber's inbox. Just not the intended David Ingber. When David Ingber, a writer and producer of Major League Baseball's Fan Cave, received the invitation to come out to the Pearlstone Retreat Center in October for a few days of discussion with American Jewish leaders he presumed he was the intended recipient and was honored to have been asked. When it was discovered by the planning team of The Conversation that the invitation went to the wrong David Ingber, the non-rabbi David Ingber was disappointed and asked if he could still attend however, he also explained that he would understand if it wasn't possible. And so, both men named David Ingber are here to share their unique wisdom with other leaders. And while David Ingber from MLB Fan Cave might not be what most would consider a Jewish leader in the traditional sense of the term, he is Jewish and he does have wonderful and creative insight to share. While talking to Rabbi David Ingber about his invitation for The Conversation going to the wrong David Ingber, he articulated how this situation seems to be the positive version of the well known Talmudic story of Kamsa and Bar Kamsa. The story, which appears both in the Babylonian Talmud (Gittin 56a) as well as in Lamentations Rabbah, takes place in the 1st century CE. For an upcoming party a wealthy man sent his servant to deliver an invitation to his friend, Kamsa. The servant, however, delivers the invitation to a man named Bar Kamsa, an enemy of the wealthy man. Upon seeing the hated Bar Kamsa at his party, the host orders him to leave. Bar Kamsa, attempting to avoid public embarrassment, offers to make peace with the host three times, even offering to pay for the food he eats, then for half of the expenses of the party, and then for the entire party. Each time the wealthy party host refuses. Fortunately, in this case some twenty centuries later Gary Rosenblatt agreed to allow the other David Ingber to attend and both men have become friends. For me personally, I'm thrilled that both David Ingbers are here. 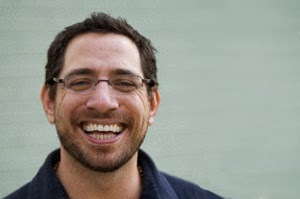 Rabbi David Ingber is a spiritually energetic, out-of-the-box teacher with so many creative ideas. And as a die-hard baseball fan, I couldn't be happier to have MLB Fan Cave David Ingber here during the Postseason to watch the playoffs with me and share his amazing stories of filming the top professional baseball players in funny, pop-culture inspired videos. Both have so much to offer and I'm grateful that the invitation arrived in the unintended Gmail inbox. When I posted this funny story of mistaken identity to Facebook, my AEPi fraternity brother from Michigan State University also named David Ingber commented, "Actually they were looking for the attorney David Ingber from Farmington Hills [Michigan]. I'm still waiting for my invitation." So what was the lesson learned from the Talmudic story? I'm disappointed if there's not a good lesson to go with the story. Sheri, the story is a bit more nuanced and complex than most people realize. In fact, Jason, while the story you tell of is, indeed, wonderful, and opposite of the talmudic story in several ways, i'm afraid you're a bit liberal in your paraphrasing (nowhere does the Talmud tell us Bar Kamtza's motivation for requesting to stay, and your presumption of his intention strongly skews the story), revealing a prejudice toward a popular understanding of the story. I highly recommend rereading the entire passage, including the other two stories in the trilogy of which it is a part, and always in light of Rabbi Yohanan's introduction and conclusion. Also, pay attention to which evaluations are Rabbi Yohanan's as opposed to those made by characters in the story. Evaluations made by characters in the story must be assessed for reliability in light of their character as revealed by their actions. In short, Sheri, there is certainly at least one lesson in the story, and it's well worth delving in to mine it, being wary of accepting the popular understanding too readily. I threw out some major hints how to do it. Have fun.